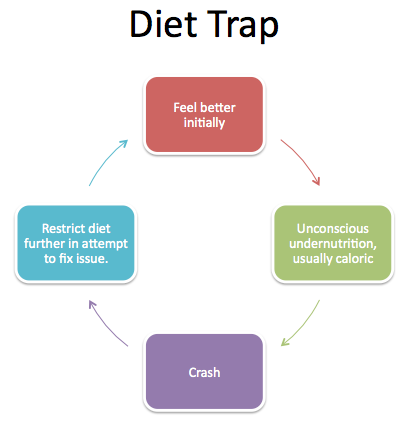 Usually one of two things happens: one day they have something that’s not on their “diet”, they over-do it and binge, feel guilty, go back to depriving and restricting until their next binge, and the cycle continues. OR they simply just give up on their “diet” because they can’t continue restricting, feeling deprived, having cravings, and being miserable all the time. So they go back to eating poorly, and then slowly but surely, gain back all the weight they lost, plus some. These are usually the people who are always either eating horrible or on a strict diet, otherwise known as “yo-yo” dieters. The problem is that neither of these people ever achieve long-lasting success when it comes to weight loss. Why? Because they have failed to achieve a sustainable lifestyle change that allows them to lose the weight and keep it off. 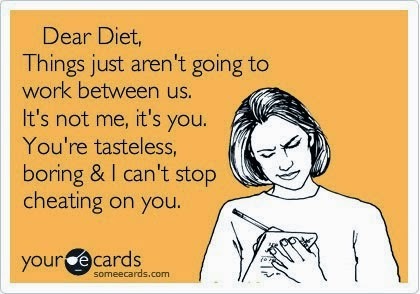 The thing is, if your diet is all about depriving and restricting, as most diets are, you can only last for so long! Rather than focusing only on what you need to cut OUT of your diet, try focusing on things you should add IN. For example, many people don’t eat enough protein, so that could be the first place to start. Make it a goal to have a lean source of protein with every meal. Maybe you don’t get in enough Omega-3 fatty acids in your diet, so you could add in a fish oil supplement. Other ideas: drink more water, eat more vegetables, eat a balanced meal every 3-4 hours, and cook more meals from scratch. 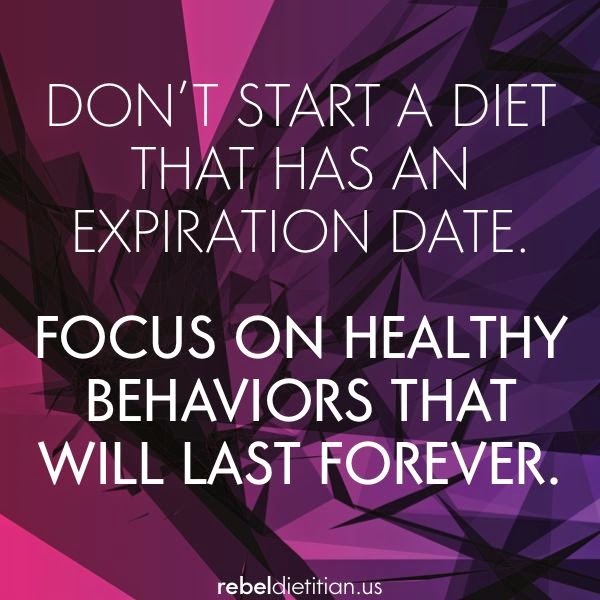 Then you can start slowly cutting back on other things, or swapping them for healthier choices. Many people simply make the mistake of trying to do all of these things at once, drastically changing their whole diet and lifestyle overnight. This may work for some, at least for a little while. But for others, it lasts a few weeks, maybe even just a few days, and then they give up. Instead, just pick one or two of these things to focus on at a time until you can implement all them into your lifestyle consistently. Yes, the results will come slower than going on some crash diet, but it will be easier for you to maintain the weight loss in the long run, which is really the goal, right? Another reason people fail in their fat loss efforts is due to their mindset. Many people view foods as either “good” or “bad”, or label certain foods as “diet” foods or “off limit” foods, etc. What usually happens with that mindset is that they believe that those “bad” foods will make them fat so they avoid them at all costs. What also tends to happen with people is that they equate their results to the fact that they didn’t eat carbs…so that must mean that it’s carbs that make you fat! Or if they gave up meat, then it must be that meat makes you fat! What they don’t understand is that the weight loss they achieved was most likely simply because they lowered their caloric intake as a result of eliminating an entire food group from their diet! For most people(there are exceptions), losing weight is simply a matter of decreasing caloric intake. What that ultimately means is that can eat ANY kind of food as long as you stay below your calorie goal for the day. So guess what? 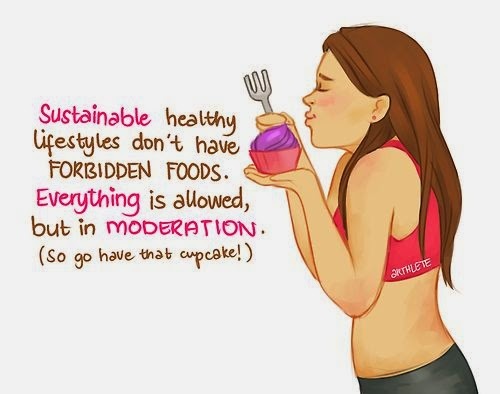 Eating a cupcake is NOT going to instantly make you fat! Yes, you should choose foods that are nutritious and make you feel good the majority of the time, but you should not have to force yourself to eat foods you don’t enjoy just because you think they’re good for you. This is when counting calories or tracking macros can be helpful because then if you do want to have a brownie or cupcake, or whatever, you simply fit it into your daily allowance and enjoy it guilt free! So instead of having the mindset that you’re on a “diet”, or that certain foods will make you fat, focus on eating healthy, nutrient dense foods most of the time-foods that make you feel good, give you energy, and help fuel your workouts. 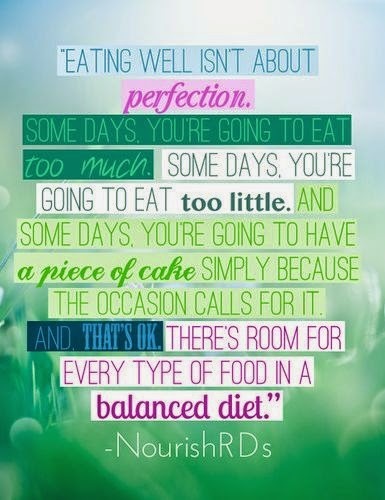 Quality of food DOES matter if you want to function well and feel good. But if you do that most of the time, it’s perfectly okay to have some treats here and there so that you don’t feel deprived. The main cause of weight gain is simply not controlling portion sizes and overeating, so as long as you are mindful of portion sizes, you can and should enjoy foods you love! -Your nutrition shouldn’t make you miserable. -Don’t fear carbs(or any food group). -You CAN eat all your favorite foods in moderation. -Be mindful of portion sizes. -Find a nutrition plan that works for you but that is sustainable. -Change your mindset about food by not thinking of foods as good or bad. Like I always say, losing weight is the easy part-maintaining it is the true challenge! But by mastering your mindset about food, focusing on health, and allowing yourself to have treats every now and then, you will be able to find a way of eating that will get you the results you want but keep you sane at the same time. That is the key to sustainable weight loss!